Fast Food News: Where's the Shamrock Shake? Since today is Saint Patrick's day, I couldn't help but recall the Shamrock Shake. Unlike the Lenten season, fast food restaurants have not (to my knowledge) made any effort to celebrate St. Pat's day... except for McDonald's with their Shamrock Shake. 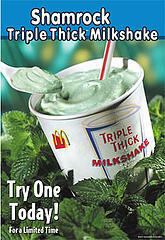 But the green, mint flavored, 'triple thick' shake is getting harder to find. Posters at The Gothamist have had a hard time finding one, but some Chicagoist readers have been 'luckier,' they've even been advertised on the radio, evidently. Leave us a comment (below) if you find the Shamrock in your town. The Shamrock Shake was such an icon as a seasonal promotional product at one time that it actually ranked its own mascot: Uncle O'Grimacey (pictured at left). There's more info on Uncle O'Grimacey on a site dedicated to bringing back the Shamrock Shake. For some great Shamrock Shake humor, check out this satire from a 1997 Onion article: Sinn Fein Leaders Demand Year-Round Shamrock Shake Availability. McDonald's only mention of the shake on their site says it is served during the green season in Ireland. Shamrock Shakes are in Madison, Wisconsin! I hate them though, I had one last year and I actually hated it so much and they exchanged it for a Chocolate. I also have finally worked up the nerve to eat a McRib just so I can know what it is like, hoping they'll bring it back. My favorite is the Cheddar Melt though! Shamrock Shakes are here in Dayton, Ohio! The Shamrock Shake has been coming to Cleveland, Oh reliably since I've lived here (10 yrs). Usually it appears for the full month of March. Okay, no McSlandering please! I work at a McDonald's in Alton IL and we have the shamrock shake all the way through March. They are really popular, so we may carry it into April. Being an employee, the McRib is my favorite limited time sandwich too, but they're horrible to make! I'm drinking one now and it's delicious. We have them here in Pickerington Ohio and Reynoldsburg Ohio. They are available in Lewisburg, PA. For those of you that are travelling on Interstate 80, get off at the Lewisburg exit and drive about 5 minutes south on Route 15. McDonalds will be on your right. The only place I know of in tidewater in virginia is at NAB Little Creek, on base, military only. NONE in San Diego California. Too much diversity in this stupid state and it offends multicultural groups here! Just another example of political correctness gone mad. In the Charleston SC area, the number of participating restaurants has decreased ever year for a few years, until this year, when I could find one nowhere. This is the first year I can remember I haven't had one. After I discovered that McDonald's had been mis-representing their fries as gluten-free for years, that was the only reason I ever went in a McDonald's. Now I have no reason at all. I'll just get a mint shake at Hardees. I've been told they've shown up at the McD's on 3rd and Townsend in SF, CA. phew! but last year they sold out far before st.pat's day, so get em soon! (my mom bought larges and froze them when i was a kid- so we could drink them through april)! In ten years, I've never seen one in Central Texas. No idea why. Never seen Arctic Orange shakes either. I went to college up in Doylestown and all of my friends fell in love with the minty fresh shake. When we graduated and St. Patties day came around they were all jealous that my home town had it but theirs did not! One reason to miss college!